We can argue all day which video is funnier -- Sonnen's SNL-style commercial parody approach or Griffin and Love's next-generation, post-Tim and Eric absurdity -- but there's no doubting which video runs deeper. Griffin and Love's parody is gentle and good-natured -- they make fun of themselves for being wildly overpaid commodities whose talents don't extend beyond the basketball court and who have no idea how much such talents are actually worth ($9 million and 99 cents is their "low price" for around-the-house chores), but their mockery is broad -- it takes in all American professional athletes, or really anyone making ridiculous amounts of money. But Sonnen takes dead aim at himself and the culture (both sporting and otherwise) that rewards him for the personality he's created. He not only mocks himself for talking his way into a title shot against Jon "Bones" Jones; he also mocks the accepted, and self-perpetuating, media narrative that he talked his way into a title shot against Jon "Bones" Jones. What better way to rib the media echo-chamber than to admit in a satire that the echo chamber might have gotten it right for once? And what better way to confuse the issue than to apparently clarify the issue in a self-produced comedy video? 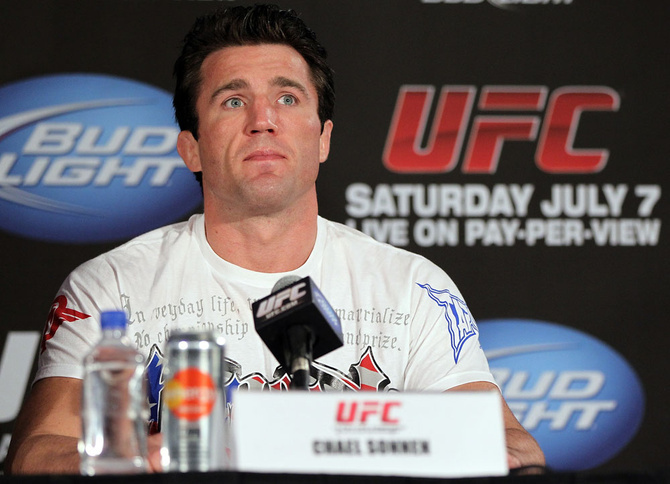 15 years into his MMA career, Sonnen has managed to carve out a weird, fluid space for himself and his alter-ego where arrogance and self-deprecation can co-exist, where the guy who punches people (and gets punched by people) for a living is the smartest guy in the room, where self-promotion is both a career strategy and an art unto itself. With his ever-increasing army of funhouse mirrors and experiments in post-modern self-reflexitivty, Chael Sonnen is not-so quietly becoming the Charlie Kaufman of professional fighting.